LUCY BURDETTE: Our incredibly prolific writer friend Edith Maxwell has a new Quaker midwife mystery out, called Turning the Tide. 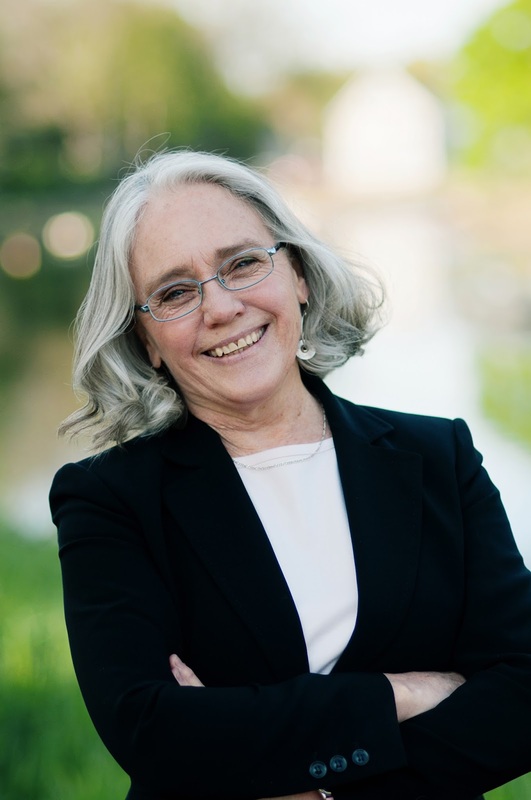 When she was mulling over what to write about here, she wondered if we'd be interested in the backstory--that is her character's faith as a Quaker. I thought we would. So welcome Edith! EDITH MAXWELL: First, thanks to Roberta/Lucy for hosting me. I’m delighted to be back, and I’ll give away a signed copy of the newest Quaker Midwife mystery, Turning the Tide, to one commenter here today. My protagonist in the series, Rose Carroll, is a Quaker, a member of the Religious Society of Friends. I happen to be one, too. I’ve found over the years that there’s a certain lack of common knowledge about who Quakers are. No, we're not the celibate Shakers, nor the Ludditely Amish or Mennonites. Or a guy who markets oatmeal in an old-fashioned hat. Most modern Friends don’t wear “plain dress” or speak in thees and thys. Friends have a long history - over 350 years - and much has been written about them. George Fox and Margaret Fell Fox founded the Society of Friends in England, and it soon spread to America. The branch of Friends that I belong to and the Meetings I attend feature unprogrammed worship. 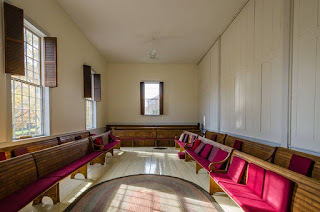 This means that we sit in silence together on pews in a beautiful and simple Meetinghouse built more than 150 years ago. We sit in expectant waiting, listening for a message from the Light. 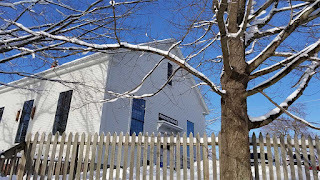 It’s the same Meetinghouse that John Greenleaf Whittier advised the building of and worshiped in, and I love writing scenes with Friend John and Rose Carroll in the Meetinghouse. The wide windows on the sides are ten feet tall, with most of the panes still being original to 1851. Friends are a tolerant bunch and, while it is at base a Christian faith, no one is quizzed on their individual belief system. One might be listening for a message from God, another for a message from Spirit, another for a message from within, and another might be mindfully meditating. All are welcome. If someone feels moved to share a message, she or he stands, speaks, and then sits. Once in a while a musical member stands and delivers her message in song. Weddings and memorial services are similar, except usually with many non-Friends in attendance. That's it. We have First Day School for the children, fellowship and refreshments, and a monthly business meeting. We hold peace vigils as well as social potlucks. Quakers believe there is that of God in each person, which leads to the core and strength of the Testimonies. We have no minister because we all minister to each other. We believe in peace and non-violence because we are all equal. Living simply frees us to help others. In earlier times Quakers wore plain dress – muted colors, simple designs, and usually the fashion of ten years prior. Rose wears simple dresses without flounces, feathers, or frippery, and a bonnet instead of a boater. Historically, Friends have been rabble-rousers in the name of peace and equality. Mary Dyer was hung on the Boston Common in 1660 for preaching Quakerism. John Woolman traveled the American colonies urging people to give up their slaves. 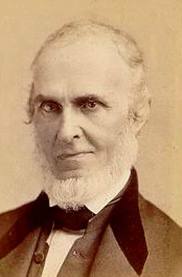 Poet and abolitionist John Greenleaf Whittier was a lifelong Friend. Quaker women from Lucretia Mott to Susan B. Anthony to Alice Paul were leaders in the women’s suffrage movement. In my series, Rose’s mother is an ardent suffragist. Many modern Quakers have been conscientious objectors in time of war. I came to Friends as an adult, so I am a “convinced” Friend. I find that quiet worship in community suits me, as do the Testimonies. Being a Quaker suits midwife Rose, too. It's not for everyone, though. I knew someone raised as a high Episcopalian and he couldn't handle all the silence. When I visited his church, I couldn't take all the busyness. Readers: What did you think Quakerism meant? If you have ever sat in silent Meeting for Worship, how was it for you? I will give away a signed copy of Turning the Tide to one commenter here today. 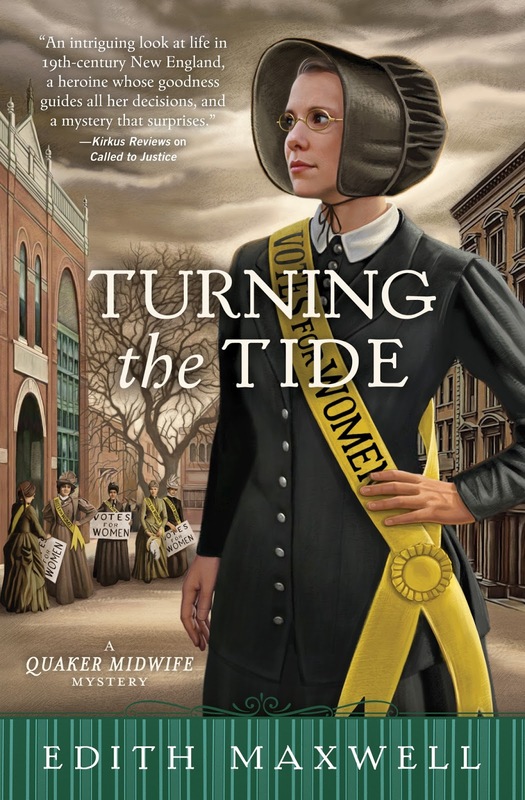 In the third Quaker Midwife Mystery, Turning the Tide, the Amesbury Woman Suffrage Association plans a demonstration for presidential election day of 1888 and Quaker midwife Rose Carroll joins the protest. Elizabeth Cady Stanton comes to town to help the cuase. When Rose finds a lead suffragist dead the next morning, she must deliver more than babies. Her own life is repeatedly threatened as she sorts out killer from innocent in a New England mill town. Agatha- and Macavity-nominated author Edith Maxwell writes the Quaker Midwife Mysteries, the Local Foods Mysteries, and award-winning short crime fiction. Called to Justice, Maxwell’s second Quaker Midwife mystery, is nominated for an Agatha Award for Best Historical Novel. Turning the Tide releases April 8. As Maddie Day she writes the popular Country Store Mysteries and the new Cozy Capers Book Group Mysteries. Biscuits and Slashed Browns came out January 30. Maxwell is president of Sisters in Crime New England and lives north of Boston with her beau, two elderly cats, and an impressive array of garden statuary. She blogs at WickedCozyAuthors.com, KillerCharacters.com, and Under Cover of Midnight. Read about all her personalities and her work at edithmaxwell.com. Congratulations on your new book, Edith . . . Rose Carroll sounds like someone I’d definitely like to meet. Thank you, too, for the information on the Quakers. I had a general awareness, but many of the specifics you’ve mentioned gave me a much deeper understanding, especially since I’ve never been to a Meeting for Worship . . . . Thanks, Joan. Happy to help! Congrats on the new book Edith. I hadn't taken the time to realize just how many interesting series you were writing and I do like the sound of this one and the Cozy Capers series as well. Guess I'll have to plan on grabbing up the first books in those series or wait until your late May signing and hope that you have some of the books there. Since I am not particularly religious, I'm not sure that I gave much thought to what Quakerism meant. Do you live on the Cape, then, Jay? I hope to meet you! I live just off Cape, but within driving distance. I should mention that the snowy picture of the Meetinghouse was taken by Christine Green. Thanks so much, Coralee! Duckie - that's so funny. Congratulations on the release on your new book. Thank you for sharing the Quakerisms and your journey. I have never sat in on a meeting but would be curious to observe. They are wonderful spiritual principles to live by each day. Thanks for the chance to win a copy of Turning the Tide. Normally Quakers don't do baptism. A welcoming Meeting, perhaps? Funny story - but did SHE speak? Welcome Edith! I have never sat in silent meeting..but I can imagine it's profound.. Does it take some getting used to? I suppose everything does! It makes one realize we're so accustomed to have something external HAPPEN. I am off to Washington DC for the day..back tonight. Congratulations, Edith, on your mad success! Thanks, Hank! I think Meeting for Worship might take some getting used to, especially if you are accustomed to a busy church services as my Episcopalian-raised friend was. It's been interesting to see when we get an influx of newcomers - after the 911 bombings, after November, 2016. People gravitate to the solace of silence in a peace-minded community. So excited about your new book! I really love your series! While I have never had the chance to attend a Friends Meeting, I do think it would be something I would enjoy. I sit and quietly reflect several times a day. Normal worship at a church is no longer something I enjoy. Too loud, too busy, and dare I say, too preachy. Thank you for the chance to win a copy of Turning the Tide. I am delighted you love my stories, Deb. I once visited a Unity church. They had powerpoint slides (yikes) and when they asked for a period of silent meditation, I finally relaxed. Except it only lasted thirty seconds. Not my kind of place. Edith, I'm so looking forward to this third installment of Rose Carroll's story. She is such an interesting character, and I learn so much with each book. Your deep experience gives them an added dimension that is so compelling. Richard Nixon was a Quaker, wasn't he? It's hard to reconcile that fact with his later actions, but we are all human, and therefore flawed. I'd hate to be held up as the ultimate example of cradle Catholic, I guess. Our stockbrokers for well over a decade, father and daughter, were/are Quakers, and I learned some facts from Kathy, who is still a friend. But your explanation, as well as those Rose Carroll offers in your books, have deepened my understanding of the faith. If I were to consider participating in organized religion again, I'd probably choose to be a Friend, as that most closely aligns with my current belief system. Thank you, dear Karen. Nixon. Well, yeah. As I understand it he didn't practice as an adult. Happy release day and thanks for explaining about Quakers. Congratulations on the new book, Edith! I've only been to a Quaker funeral. The attendees were asked to share their memories. It was lovely but it went on forEVer. Not a church for the impatient. Ha, Hallie. So true! And thanks. Congrats on your new book, Edith! I'm going to find the first one in this series and share it with my midwife friend. I had a beautiful experience with Quakers many years ago, at a week-long yoga workshop on Saltspring Island in (beautiful) British Columbia: We started the day with a simple quiet meditation. One morning, one of the participants - a woman from Montana, who was a Quaker - rose from the floor and raised her voice in song. It was glorious. While I don't remember her name or the song specifically, I surely do remember the joy of that moment. When I think of Quakers, I think of her and the sonoral beauty she created for us all. Thanks, Amanda. I love reaching midwives with these books. What a lovely experience of a vocal message arising out of the silence. Welcome to Jungle Reds, Edith! I remember meeting a Quaker couple when I was travelling in England. We were having a conversation then they told me they were Quakers. I remember the Quaker on the cereal box and I thought that was from another era when men wore tricorn hats. Thank you for sharing about the Quakers. I always enjoy reading your series about the Quaker midwife Rose. Thanks very much, Diana! I have read that the oats company adopted Quaker as their name and logo long ago because they thought it signified purity and health. Your new release sounds fascinating and special. I enjoyed learning about the Quakers. Thanks for this informative and interesting article about Quakers. Their principles are important. Congratulations on your release. Thanks so much. The principles work for me, for sure. I knew quite a bit about the Quakers, but that's the first I've seen of the inside of a meeting hall. It's lovely! You mentioned that yours is a church with unprogrammed worship--and I seem to recall reading a series by a Quaker pastor which certainly seemed to include a service as he was always trying to write a sermon. We have a local Friends' Church, but I've never attended; the signage seems to indicate a programmed service there and I know one of the members--a very loud overbearing person who would be in the thick of organizing/programming anything that was happening. So I aim for quiet time at home, especially in my walks. Thanks, Flora. Yes, there are programmed Meetings with pastors, many of them in the Midwest, but also in Cuba and East Africa. You might be thinking of Phillip Gulley's Harmony series. He also writes nonfiction about Quakerism. Interestingly, the Indianapolis Meeting has both unprogrammed and programmed worship every week. Yes, Phillip Gulley's series--highly recommend to anyone looking for a humorous take on small-town life from a Quaker pastor's perspective. Hmm, that is interesting about the Indianapolis Meeting. When I was in high school I knew someone who attended the local Quaker meeting house. My understanding of the meetings was that they lasted for several hours, and that anyone who wanted to speak was listened to respectfully. My friend was later killed in Vietnam and it just occurred to me as I was reading today's blog post that he was buried from a different church. Edith, I love your Midwife series. My maternal great-grandmother was a Quaker but am not sure what happened to the line after that. My mother talked often about her grandma's cap she wore. It would have been wonderful to have known her I'm sure. Thanks, Robin. We miss a lot by not knowing the previous generations. Several years ago, we attended a memorial service for a lovely neighbor at an unprogrammed Quaker meeting house. It was also an old, classically New England building like yours, Edith, and the perfect quiet space for the solemnity. I'm definitely in the camp of Episcopalian-who-would-go-crazy, though. If I don't get to belt out Victorian hymns in four-part harmony, it's just not church for me. LOL, Julia. To each her own! Congratulations on the book, Edith. Your description of Quakerism is pretty much what I thought, with a bit more detail. I would be fine with the silence. Although a Catholic Mass is pretty "busy," I attended a Catholic university run by the Franciscans; I regularly went on retreat to "the Mountain," our retreat center. Part of that weekend was always sitting quietly in the chapel, meditating and waiting for God or the Spirit to speak to you. If you felt compelled to share, that was welcome, but you didn't have to. With the view of the valley, it was lovely and peaceful. Those retreats sound right down my alley, Mary. And thanks! Like several others who commented, I am conceptually pretty familiar with Quaker worship, but I have never experienced it. And I appreciated Coralee's mention of Buddhism seeming similar in style. My young adult son has left the Catholic church and is currently exploring Buddhism, but I'll bet he would find the Meeting for Worship appealing, too. I am one who finds comfort in the ritual of the Catholic church, and loves polyphonic music. But I am also one who recognizes that we each have to find the path that works for us! Thank you, Susan. It's interesting that one of my sisters is a seriously practicing Buddhist - and the other a Mormon. We're a bad bar joke! I actually wasn't familiar with Quakers beyond William Penn founding Pennsylvania until I started reading your books. Who says you can't learn interesting information from fiction? And this is another great book. Be sure to grab a copy. Thanks, Mark - and thanks for your five-star review today! So interesting! I am going to try your books. I love history, so am aware of the history of the Quaker movement. But much of what I (think) I know is from one of my favorite movies, Friendly Persuasion. It's a lovely story set during the Civil War about a family of Friends whose farm is overrun by the war and their teenage son decides he has to fight for the Union. Are you familiar with it and does it properly represent Quaker beliefs? I haven't seen it in a very long time. But certainly some Friends have joined war efforts - and others haven't. Enjoy the read! Congrats on the new book, Edith! 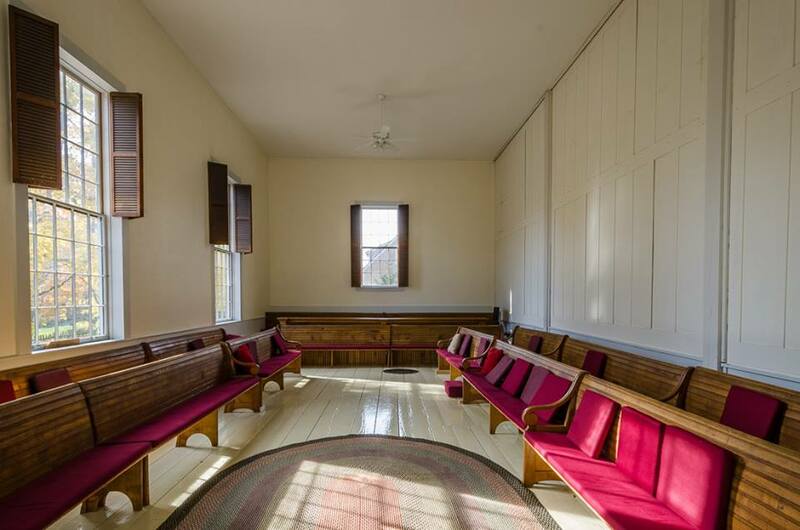 I've never attended a Quaker meeting house, and I'm curious about the kinds of things people say when they choose to speak. Do they talk about themselves and their faith? Discuss the world at large? Do others respond in any way or just listen? Thanks, Ingrid. Well, traditionally messages are shared because they are received frm God/Spirit/the Light. In practice the messages really run the gamut. Gratitude. Concerns, both personal and wider. What someone has been thinking about. A bit of wisdom. At base is that it should not be prepared in advance. It's something that comes to you as you sit. Of course, some are longer winded than others! Some First Days are blessedly completely silent, others are what we call a popcorn Meeting for Worship - someone standing up and sharing every few minutes! The practice is not to reply directly to a message, but sometimes a theme sort of sets up for the morning, impromptu, of course. A point of terminology. The meetinghouse is the building. The Meeting is both the worship and the church. So I attend Friends Meeting, and I'm a member of Amesbury Friends Meeting. Thanks for the info, Edith. That sounds very peaceful, but also engaging since being quiet is not always easy! I confess to entire hours given over to my shopping list, my latest tiff with someone, or worrying about a plot point. Not always easy, for sure. Congratulations on your new book! Looking forward to reading it and many more of the series. They are great!! Edith, congratulations on the new Rose book--I can't wait to read it. And thanks so much for the information on the Friends. I was most familiar with the conscientious objectors in WWI and WWII. I joined the Episcopal church (having been brought up Presbyterian) because I loved the ritual of the high church service. However, these days I find the most peace and sense of connections just sitting quietly. And the Friends principles are certainly those I wish more of us practiced! Thank you, Debs. Sitting quietly has a lot to be said for it. Contrary to East Africa, in West Africa, where I lived for two years with my husband and sons, there are no Friends Meetings to be found. I occasionally would sit for an hour on the veranda at 10 AM on a Sunday - but it's not the same at all as sitting in community (my Buddhist sister might agree). I went to college in central Pennsylvania where there was a strong Quaker Meeting. One of the members was Euell Gibbons, as was one of my college boyfriends. I found the "service" lovely. Those were turbulent times (Vietnam war time) and the peacefulness and insightful sharing were wonderful. Much needed during those times, Libby. How cool to meet Euell Gibbons! Thanks for your article. I grew up in PA. and learned about the Quakers then. I think it would be very hard to sit through an entire church service being entirely quiet. It is a very different religion. Shalom Edith and Reds, I look forward to reading the new book. Long ago, when I had started high school, I became friends with someone my age who was both an avowed pacifist and a vegetarian. It was the time when the anti-war (Vietnam) movement was starting to burgeon nationwide. There was a book that I bought that explained in layman's terms the entire Selective Service law. I learned that in order to qualify for conscientious objector status it was not sufficient to be a pacifist. One generally had to have been part of a faith-tradition that eschewed fighting in war, like the Quakers. That, I think, led in part to my subsequent decision to apply to Swarthmore College, which had been founded by Quakers. Although the college was no longer a Quaker college there was still a tradition of focusing on peace and associated political themes. There was a thriving Meeting on campus and although I never became a Quaker I spent many First Days there in quiet contemplation. Later in life, I had the privilege of living in the servants quarters of the colonial home of James Logan which had been turned into a museum. Logan was the personal secretary to William Penn for a time and engaged in all sorts of civic activities including the founding of the University of Pennsylvania. I paid almost no rent in exchange for being a tour guide of the museum. I just now looked up James Logan on Wikipedia and learned for the first time that he was an anti-pacifist who encouraged Friends to give up their elected positions making it easier for local governments to prepare and fund war preparations. I now have lived in Bucks County Pennsylvania for the past 25 years where there are a plethora of Friends Meetings and I remember attending First Day meetings in Doylestown, PA, once or twice. I think there is something healing about sitting in silence and listening to others without turning it into a conversation. A long history, David! I agree about the healing power of silence and listening. You explanation and my perception of Quakerism are similar. I have read about it in the first 2 Rose books; they gave me additional insight. I have never been to a Quaker meeting, however I have attended 2 silent retreats offered at a monastic convent. I found them to be very spiritual experiences, restorative and a bit challenging for a talker like me. The positive benefits outweigh my urge to talk; I definitely hope to attend another one in the near future. Congratulations on the release of Turning the Tide; I'm looking forward to reading it. Thank you so much, MaryAnn. I am normally a big talker, too - maybe that is one reason I need Friends worship. Mostly what I know about being Quaker comes from a movie, Friendly Persuasion, which I remember fondly. Wonder how accurate it really was. I am very interested in reading and learning about other faiths and seeking peace seems like a very good idea to me. I loved the first Quaker Midwife book; I'll have to catch up. I've enjoyed your previous books... looking forward to reading this one! Thanks for sharing, I found it very interesting. I have found in my genealogical pursuits that there are a number of my ancestors who were Quakers. Mary Dyer was my 9th great-grandmother, and another branch of my family came to the colonies with William Penn. I look forward to reading your books and learning more about the Quaker faith. This was fascinating, Edith. And I love, love, love the cover of your book. Congrats on your latest release, my prolific friend! Edith, that's a lovely and grace-filled explanation; thank you! I've appreciated the potent roles Quakers have played in our nation's history and the drive for justice, especially in New England. My grandmother was a Quaker, and my mother remained attached at heart, although she was not one to sit in Meeting; my brother is an active member of a Meeting in the Midwest, and continues to impress me with his deep grasp of Friends' principles. I've joined him at silent meeting, and look forward to doing so again. Your Quaker Midwife Mysteries are a wonderful way of talking about this path, and I enjoy them very much. Thank you for the explanation Edith....interesting to hear the details and how it is a good fit for you. Taking time away from the everyday noise and chatter would seem like the clearest path to connecting with the Holy Spirit, or connecting within. Back in another century my Providence College of Nursing school went every year to a silent retreat at St. Clares in the Santa Cruz Mountains. It made a profound impression on me and I revisited even after I was married and had children. Meditation fills some of that need now to clear space, but silence in Community must be profound at times. Congratulations on your latest in the series......I purchased the first two, so happy that the series is continuing. Congratulations on your new book, Edith. I love all your stories and today's post is very interesting. I like to learn relation of people with faith, beliefs or no-beliefs or with religion in general. I took evening couses of theology for five years. I like the five testimonies of the Quakers, especially symplicity which is a value a lot lacking in our world. Also, when traveling , I like to visit churches of different faiths and attend masses ( or services or meetings or wathever name of the ceremony) if I feel welcome. As I'm planning to visit Amesbury (my father birth place) one day, probably next year when I'll be retired, I think that I would like to experiment a Friends meeting if possible. We learned about William Penn in school but your books provided more details on the actual religion. I couldn't handle a whole service in silence unless I read or something. Wow, Euell Gibbons! My dad had all his books, and we saw him across the airport once. Dad gave up hunting wild foods after we ate something really bitter. He changed to regular gardening. All Dad's hobbies involved food: fishing, berry picking, stalking the wild asparagus, and gardening. Luckily Mom was a good cook. Congratulations on your new release, Edith. Your post was very interesting and informative. Before reading your article, in my mind I was thinking of Quakers as Shakers. I have never been to a meeting or known anyone that was a Quaker. Would really like to read more about the Quakers and I'm looking forward to reading "Turning the Tide". I am out of town and missing checking in here each day. I need to plan better so I'll have time to do that. I had to pop in today when I saw it was Edith and her Quaker midwife series. Rose is a wonderful character, and I'm looking forward to another great read in this book. Thank you for the wonderful information. I had minimal information and think I can understand it a bit better now. It sounds wonderful. Congrats on the new book release! My first encounter with Friends was in the '70s Peace Vigils. I attended service once or twice as well -- finding great trouble with the silence part, but great admiration for the principles and social conscience. I admire Rose as well, especially for "speaking truth to power." This is so interesting to me. Just yesterday I was thinking that after spending most of my life in a religious community that was relatively rigid--which I love, but in which I do not fit--that I might find a better home in the Unitarian Church, where, to my understanding, one can believe what one believes while worshipping. It sounds as if belonging to a Quaker congregation is much like that and might also be a good home. I'm curious--how do you teach the kids to be quiet? In our meetings, the children are present and always so noisy, even during the time set apart for quiet reflection and reverence. The hope is that by being there and observing they will learn to be reverent, but "silent worship" it is not. Thank you so much for sharing. I find myself eager to read your series. I confess I did not have any notions about what Quakerism means, I was quite uneducated. I'm trying to recall which TV series I recently encountered on streaming (either British, or maybe it was Wallander?) wherein the main character investigator was invited by a romantic interest to attend her worship Meeting. I was intrigued, and now I understand why everyone sat in silence. I especially appreciate your closing remarks about Episcopalian friend unable to handle the quiet of your Meeting and you had trouble with the busyness of his worship service. I have no qualms or disillusionment with the Faith I was raised in and raised my children in, however, I suspect that at this point in my life, I am better suited to your Quiet than to my own Faith's "busyness". Again, thank you. I am looking forward to the new book and enjoyed this post very much. I do know about the role Quakers have played in US history and it is impossible not have great admiration. In fact, I think I'll share this now with a friend of mine who is a lifelong Friend. Tealady Kathryn, you are the winner of my book! Please send your snail mail address to edith@edithmaxwell.com, and congratulations.